No matter how you swing it, getting lost is not fun! Whether you are trying to drive somewhere unfamiliar or you’re out for a jog🏃🏼‍♀️, let’s face it, you don’t want to lose your way. The same rings true when you are visiting a website. Nobody wants to check out your advisor site only to find that it is tedious and hard to navigate. We also live in a society that wants answers immediately, so searching around a cluttered site simply doesn’t work. Due to this short window of time you have to capture visitors it’s important that your advisor site is simple to navigate and quickly catches your visitors eye. What Exactly is Website Architecture? Great question! Website architecture is the way your website is structured or how the structure can help users easily and quickly find the information your visitors seek in order to drive conversions for your business. Why Is Website Architecture So Important? Website architecture is so crucial when it comes to drawing in your visitors and hopefully turning leads into clients. Obviously, this strengthens your website’s user experience and when you structure your website in an intuitive way, users can find the information that they are looking for effortlessly. In addition to the above, when your user experience is strong, your search engine rankings will be, too. If your website navigation is simple to peruse, then users will spend more time on your website. 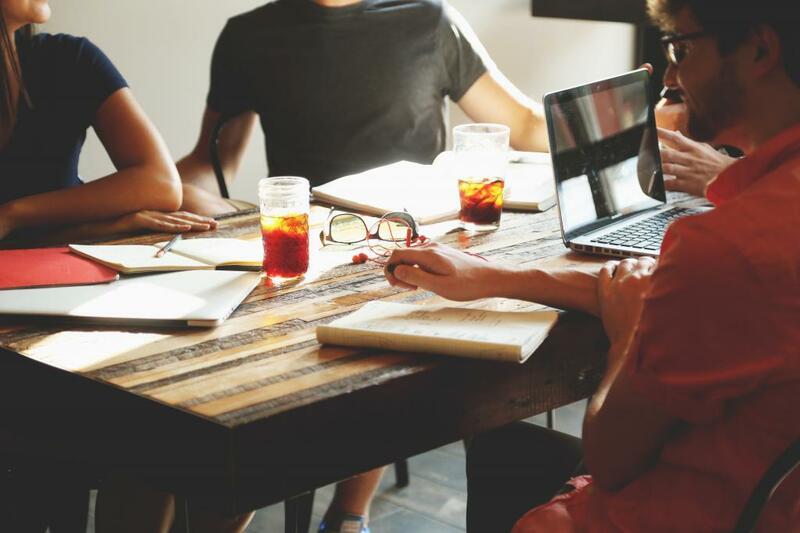 Because of this, you want to be producing quality content that shows you are a thought leader in the industry and that you can quickly and easily answer questions. As if this didn’t show enough importance, a solid website architecture also helps search engines crawl your website better. How Do you Develop a Good Website Architecture? If your site is hard to navigate, then it’s likely that your bounce rate is going to be very high, and that is definitely not something that you want! Because your visitors are spending 15 seconds or less on your website, it’s important you make as simple to navigate as possible. Why would anyone want to waste their already precious time trying to navigate a confusing site? They wouldn’t! This is why it’s important to put yourself in the mindset of your potential or current clients. Is this the time to think about introducing something new to your site, such as a live chat feature? Be intuitive and sympathetic to how your visitors think and be mindful of their time. 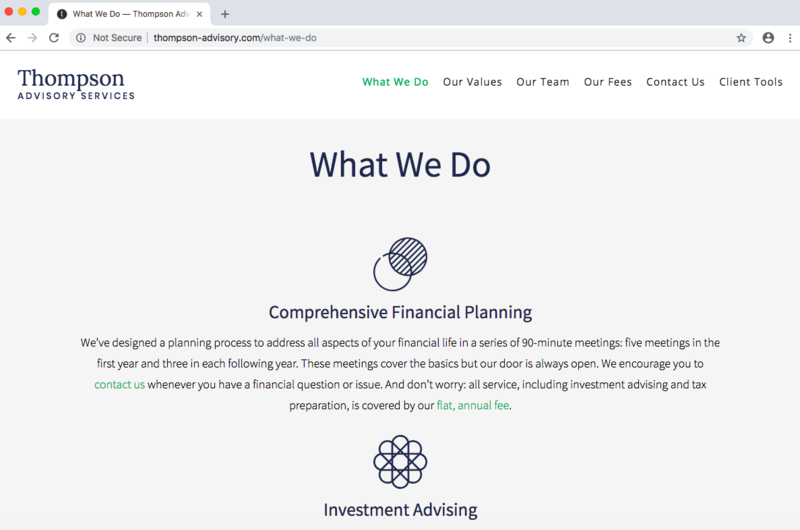 In the example below, Twenty Over Ten client, Thompson Advisory Services, has an easy to navigate website that is simple and fresh with six pages. Their “What We Do” page very simply spells out the services they offer without having to search all over the site. Customers in the business are used to seeing how the big powerhouses run their companies and how they set up their websites. 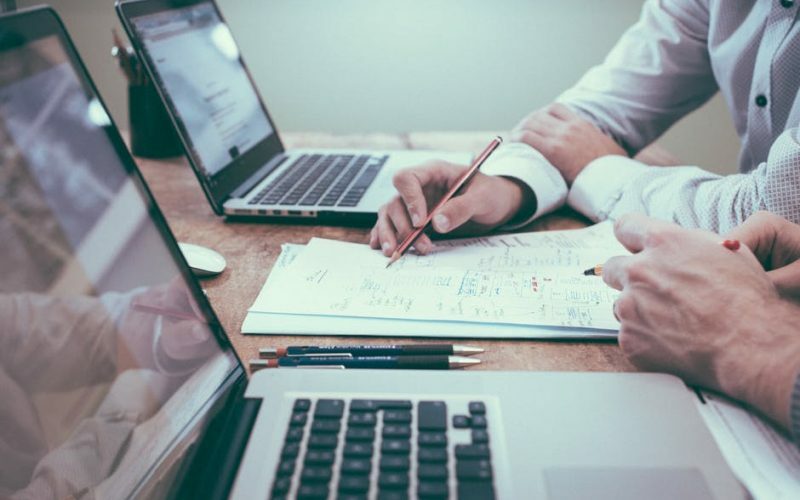 When it comes to designing your website, it is okay to model it in a similar fashion to what works for the “big wigs” in the financial industry. 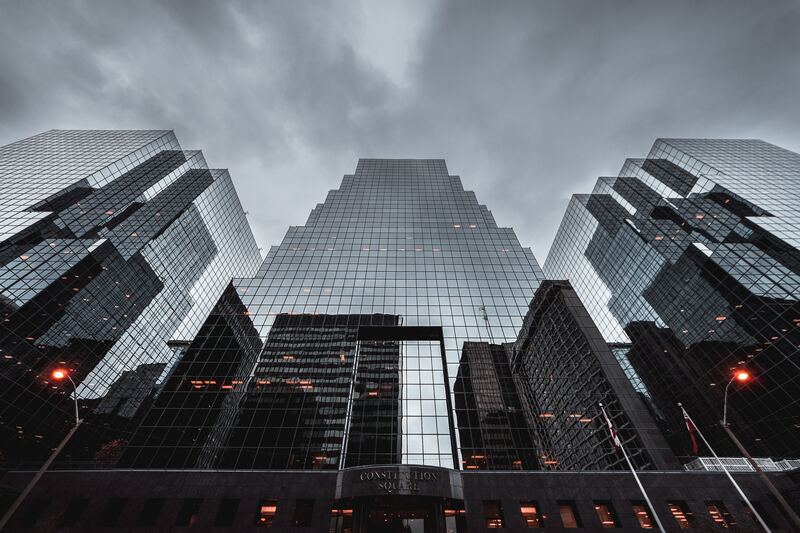 If you are a smaller advisory firm just starting out, and you like the look of say an Ernst & Young’s website, Deloitte, or a similar well-established firm, then you consider doing something similar layout-wise for optimal navigational purposes! The format of your website, design principles, and links should all follow a consistent pattern. Good design absolutely matters for your advisor business, you wouldn’t want to use different fonts or sizes that are not uniform, etc. Keeping these elements the same will keep your users on your site longer, because it will be much more aesthetically pleasing and they can quickly navigate to sites while also clicking on pertinent links. 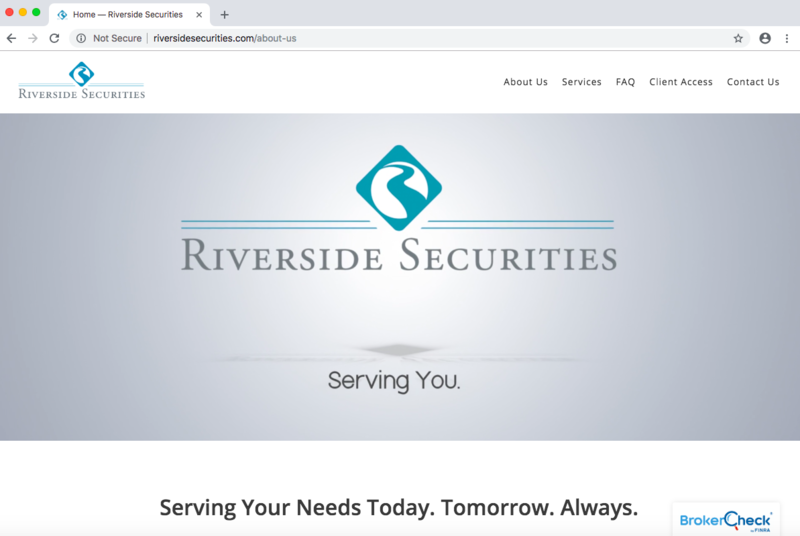 Riverside Securities, a Twenty Over Ten client, has a very uniform and consistent website with a single-page scrolling site. It is simple to navigate with a clean feel to it. When building your advisor site, linking external and third-party sources are a great way to site other companies and direct visitors and leads to other helpful information. It is pertinent that you are making sure that the information is useful and relevant. Internal linking strategies can help boost your SEO and drive traffic to your site. Creating internal links is all about directing your users to additional content that makes their search easier. When we are redesigning websites at Twenty Over Ten, we suggest not having more than 15 pages total in an effort to keep your website uncluttered without the extra mess that you no longer need. But no matter how many pages you do end up having, the architecture of your site should be set up in way where any page can be reached in 3-4 clicks max. 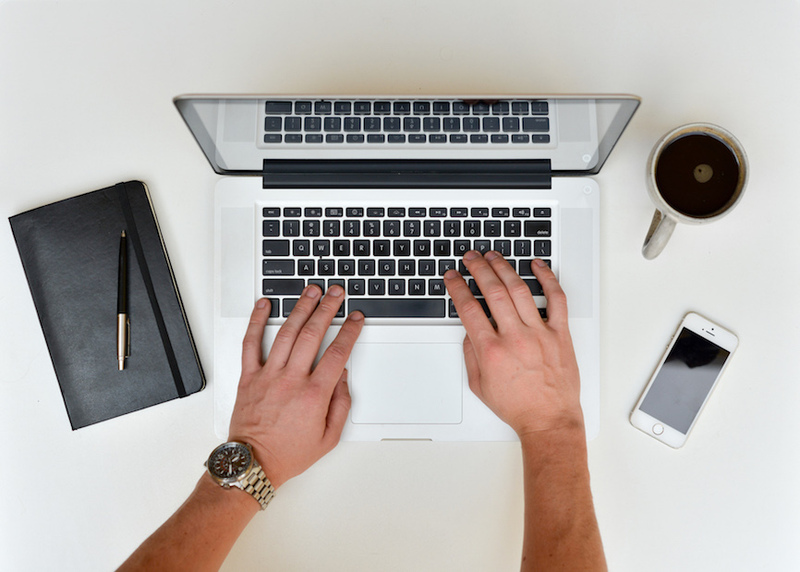 Ready to Perfect Your Advisor Website 🖥? Work with Twenty Over Ten’s design team to build a website and generate more business for your firm. With automatic site archiving, unlimited blogging, SSL certificates and more — we’ve got everything you need!